Goldtoast Supper Club is a unique dining experience, not only about the food but the company and a cheeky bit of adventure. From New York, to London, to Cuba, these secret supper clubs and guestaurants offer an alternative dining experience for those looking for something new, fun and exciting! Goldtoast was started by Bree and Chloe in December 2011, and is now run by Bree and her merry-band of helpers. Goldtoast Supper Club is a small popup restaurant with a much more casual attitude, located on the Gold Coast Queensland, with roving premises. Each location is a tightly-wrapped secret and is only revealed after a ticket is purchased. Guests eat from a set menu and are expected to fraternise with other guests who they may not know. Our events enable groups of people (who may not ever meet in day to day life) to sit together in a secret location, have a drink, make new friends, chat away, spin a yarn, laugh loudly and share a delicious meal. It all seems quite fun, doesn’t it!? Since late 2011 we have hosted events such as New York Brunch where we dined on Lox Bagels in an industrial estate, Cool Dude Dinner – a banquet of dude food including Pork Rib Sloppy Joes, My Giddy Valentine was a cheesy Valentine dinner, Cantina – cocktails with a four course fresh and traditional Mexican feast of Tacos and Puerco Pibil, A Brunch of Flowers where everything was flavoured by the floral or garnished with petals. So welcome, nice to meet you! The term “Supper club” is enjoying a revival with slightly different meaning – generally a small underground club (often with roving premises which are only revealed to the guests when they buy a ticket), where guests eat from a restricted or set menu and are expected to fraternise with other guests who they may not know. We don’t have a concrete location, we use whatever space we can get our hands on whether it’s someones house, a hired location or a public place. 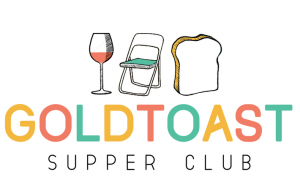 We formed Goldtoast Supper Club in December 2011 and hosted our first secret supper in January 2012. So we have been at it for a while now! Upon arrival you will receive a complimentary cocktail. After enjoying the cheese board and mingling with the other guests, you will be seated for the meal. We don’t rush through the courses as the table is yours for the whole evening (unlike in a traditional restaurant). The structure of the meal will often change; sometimes tapas style, sometimes a three or four course dinner, sometimes something different all together. Whatever the structure you will always leave satisfied! But don’t fret; there is no need to rush off until you’re ready! Our events are BYO drinks but everything else from chairs to wine glasses we supply! WHEN WILL WE BE TOLD THE LOCATION? We send the location out the day before the end, there is often a lot of thought that goes in to this final call. We have to leave it to the last minute often due to surprise weather forecasts and last minute bookings. We do post on Facebook that the text has gone out so if you’re worried you missed it you can also check. Previous Post We hosted a lovely little picnic yesterday and made a video!